Bvlgari 8190kb 5195t3 sunglasses have a black gold frame with a grey gradient polarized lens. They are made of metal and plastic and have a cat eye shape and are for women. TheseMcQ Alexander McQueen MCQ 0008/S VZH 60 Razor Temple Cateye Sunglasses in Bronze take on a 1950s cateye with a dramatic contemporary overhaul which fuses Creative Director Sarah Burton’s urban sophistication and the late McQueen’s ethereal punk style. All sunglasses lenses give100% UV protection. Helpful Links. KAREN WALKER. CATEGORY 3 SUNGLASSES. SUPER STYLISH & RARE. THESE SOLD OUT & HAVE SINCE GONE UP IN PRICE ONLINE. CATEYE STYLE. LENS COLOUR: BLACK. Get images that. make Supersized seem small. Prada Sunglasses Cinema Evolution 53SS 3SS 2AU3D0 Dark Havana Light Brown Grey Gradient have a unique geometric shape with cat's eye lift to the corners, one of the frames that is leading the trend into geometric unusual shapes right now. The thick plastic front frame blends nicely at the cat's eye corners into the metal arms with the metal continuing across the top of the frame and across the bridge in one smooth piece that heightens the luxury feel of the frame. Color Code 541713. Model HC 8247 (L1039). Lens Technology Gradient. This popular sunglasses are the actual item in photograph. Lens Color Smoke Brown Gradient. Lens Width 53 mm. Polarized?. Protection 100% UV. Michael Kors Abela III 6040 Sunglasses are a round frame with a cat eye lift to the corners and a nice round MK logo on the thin metal temples which are matched at the bridge. Studs on the inside bridge area of the frame also give a nice little detail for the Michael Kors sense of class and sophistication. Tom Ford Sunglasses 0575 Anna 52G Dark Havana Brown Mirror are effortlessly elegant cat eye style sunglasses. They're on trend this season with a prominent metal brow bar that matches the metal temples. The thick plastic front and oversized lenses provide a glamorous look and the Tom Ford T wraps around each corner to provide instant brand recognition. Tom Ford Sunglasses 0574 Mia 52P Dark Havana Green Gradient are stylish oversized cat eye sunglasses for women. The slim metal temples and bridge are a contrast to the thick plastic front and the Tom Ford T wraps around each corner to provide instant brand recognition. This chic look is perfect for all day wear as the plastic temple tips provide added comfort and adjustable nose pads ensure a personalised and secure fit. 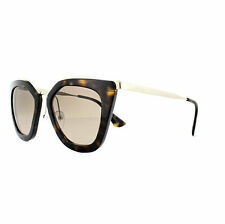 Michael kors evy 1023 118918 sunglasses have a satin pale gold frame with a grey orange gradient lens. They are made of metal and plastic and have a cat eye shape and are for women. Bvlgari 6094b 278/5a sunglasses have a gold and beige frame with a light brown gold mirror lens. They are made of metal and plastic and have a cat eye shape and are for women. Miu Miu Sunglasses. Lens Color Grey. Style Designer. Eye | Bridge | Vertical(B) | Temple |. Maui Jim Sunglasses Sugar Cane 783-02 Gloss Black Neutral Grey Polarized are a lightweight nylon frame with spring hinges and featuring Maui Jim's superior polarized lenses with supremely lightweight Super Thin glass lenses for a comfortable frame with amazing lenses. Dolce & Gabbana Sunglasses 6109 501-8G Black Grey Gradient are a cat eye style with a metal & plastic frame which is designed for women and is made in Italy. Miu Miu Sunglasses 10NS 1AB1A1 Black Grey are a fabulous retro cat's eye style with a truly unique silhouette and classy vintage appeal. Thin metal arms and bridge perch atop the geometric chunky frame to great effect. JIMMY CHOO Designer Rose Gold Cat Eye Sunglasses. Style: Cat Eye. Lens colour: Rose Gold. Made in ITALY. Case included. Lens: 59mm, Bridge: 15mm, Arm Length: 140mm. Dolce & Gabbana Sunglasses 4277 502-13 Havana and Gold Brown Gradient are a cat eye style with a metal & plastic frame which is designed for women and is made in Italy. 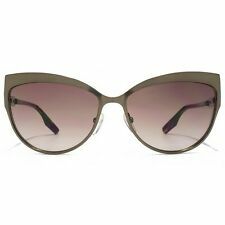 Michael Kors Sunglasses Abela III 6040 3145/13 Dark Havana Lilac Brown Gradient are a round frame with a cat eye lift to the corners and a nice round MK logo on the thin metal temples which are matched at the bridge. Studs on the inside bridge area of the frame also give a nice little detail for the Michael Kors sense of class and sophistication. Condition: Beautiful eyeglasses with demo lenses, display model. Arm Length(mm) : 135. Style Cat Eye. Dolce & Gabbana Sunglasses 6109 31238D Grey and Pink Pink Gradient are a cat eye style with a metal & plastic frame which is designed for women and is made in Italy. Bvlgari Sunglasses BV6095 20248G Black Gold Grey Gradient are an innovative cat-eye style with a multi-colour enamel mosaic that highlights the cat's eyes lift to the corners, and matching mosaics on the front and back of the arms for a truly stunning finish. Model: Adhil 792S 90W. Sunglasses Roberto Cavalli. Lenses color: Blue. Tom Ford Sunglasses Dahlia 0648 56P Havana Gold Blue Gradient are an ultra feminine cat eye style with a double bridge design. A mixed material frames incorporates an acetate front and temple tips with a metal bridge and temples. Adjustable nose pads ensure a personalised fit whilst the plastic temple tips provide added comfort. 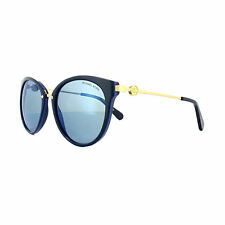 The famous Tom Ford T wraps around the front of the frame for instant brand recognition and the Tom Ford logo is presented on the temple tips for authenticity. MPN MU 02SS VA4 3C2. Miu Miu Sunglasses. Lens Color Blue. Style Designer. Temple Length 140 mm. Eye | Bridge | Vertical(B) | Temple |. Miu Miu Sunglasses 10NS USW3M1 Black Light Grey Gradient are a fabulous retro cat's eye style with a truly unique silhouette and classy vintage appeal. Thin metal arms and bridge perch atop the geometric chunky frame to great effect. Bvlgari Sunglasses BV6095 203013 Brown Pale Gold Brown Gradient are an innovative cat-eye style with a multi-colour enamel mosaic that highlights the cat's eyes lift to the corners, and matching mosaics on the front and back of the arms for a truly stunning finish. Yohji Yamamoto Designer Black Patent Cat Eye Sunglasses. Style: Cat Eye. Lens colour: Black. Made in France. Lens: 52mm. Bridge: 21mm. Arm Length: 140mm. UV Filter Category 3. Bvlgari 8187kb 5425t3 sunglasses have a grey, green and gold transparent frame with a grey gradient polarized lens. They are made of metal and plastic and have a cat eye shape and are for women. Bvlgari 8190kb 5193t5 sunglasses have a dark havana gold frame with a brown gradient polarized lens. They are made of metal and plastic and have a cat eye shape and are for women. Condition: Beautiful eyeglasses, display model. Arm Length(mm) : 140. Style Cat Eye. Lens(mm) : 51. Condition: New. We only cover manufacturer's defect. And it’s so easy to bring a touch of old Hollywood glamour to your look with these GUESS® GU7438 sunglasses…. INCLUDED : All new GUESS GU7438 Sunglasses, GUESS logo case and GUESS cleaning cloth. Rhinestone Embellished. The Miu Miu logo is engraved on a flat section of the temples. Since 1993 Miu Miu has represented Miuccia Prada's vision of an independent style, always characterized by a strong personality. 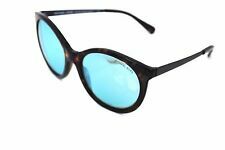 NEW AUTHENTIC MIU MIU GLOW BLUE SUNGLASSES. Condition: Beautiful eyeglasses, display model. Arm Length(mm) : 135. Style Cat Eye. Bridge(mm) : 17. Kindness and Helpfulness. (ON REQUEST). YOU ATTACH RECEIPT OR INVOICE. SUNGLASSES POLAROID MOD. PLD5015 COLOR CODE LYK WJ. MPN PLD5015. Polaroid ORIGINAL 100%. IN THE CELLULOID CLASSIC SERIES. EEC STANDARD LENSES. original case. OVERALL WIDTH FROM BOOM BOOM < span class = "notranslate" > 143 MM APPROX. Dark grey lenses; reflective gold mirror finish. - Silicone nose pads; adjustable. - Polarised; category 3 sun protection. Lens: Grey Gradient. AB rand N ew,U nused and U nworn I tem in T he O riginal P ackaging (such as Case,Clean Clothes, Authenticity P aperwork ). Color: Black White Silver. I will respond you as soon as possible! MPN 0MK1025. Style Cat Eye. And it’s so easy to bring a touch of old Hollywood glamor to your look with these GUESS® GU7438 sunglasses…. INCLUDED : All new GUESS GU7438 Sunglasses, GUESS logo case and GUESS cleaning cloth. Rhinestone Embellished. Style Cat Eye. Type Sunglasses. Color Gold Black Gray. Lens Color Brown. Protection 100% UV. Lens Technology Polarized. height of the lens! Condition: Beautiful eyeglasses, display model. In excellent condition, few small scratches on the lenses, waiting for you to replace your prescription lenses. Arm Length(mm) : 135. Style Cat Eye. Lens(mm) : 51. GG 3804/S CSA 90. NEW AUTHENTIC GUCCI SUNGLASSES. BLACK PALLADIUM. GUCCI LOGO ENGRAVED ON RIGHT LENS. GUCCI LOGO ON TEMPLES. DESIGNER SUNGLASSES SPECIALS! GUCCI CASE. GUCCI BOOKLETS.